The previous day on my Mississippi journey was a 16-hour marathon of road tripping, touring, dining and visiting friends in Vicksburg. 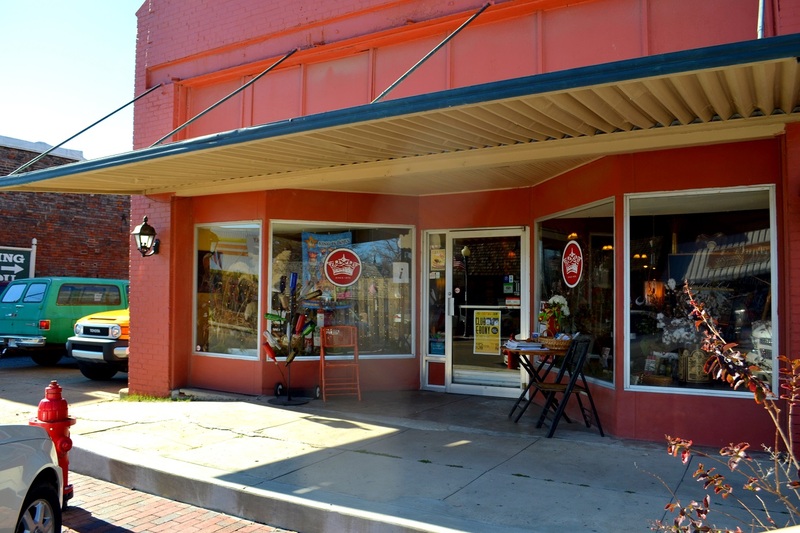 The following morning, we made a brief stop for a cappuccino at The Highway 61 Coffee Shop on Washington street in downtown Vicksburg. Afterwards, we got back on Highway 61 North and made our way to our next stop – Bentonia, MS.
We traveled about 13 miles north on Highway 61 to Redwood, and then veered east on Highway 3 for approximately 22 miles to Satartia. From there we took Highway 433 for an additional 12 miles to Bentonia. We were greeted kindly by the characteristic Holmes, who was sitting on the front porch of the Blue Front Café. 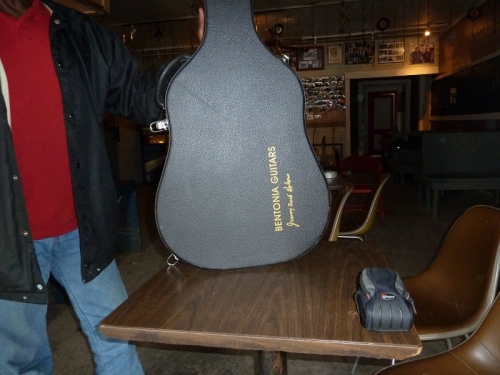 He showed us around and we checked out several of his guitars. We talked a little about the Bentonia blues and what makes it so unique. 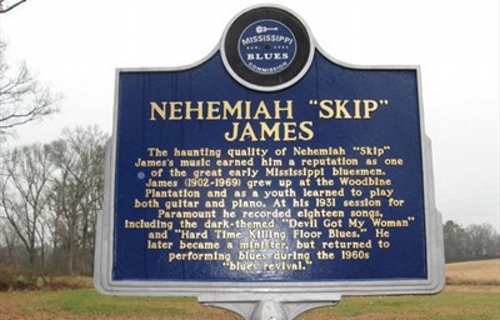 He also mentioned Henry Stuckey, the founder of the Bentonia style of Blues and his two famous students – Skip James and Jack Owens. 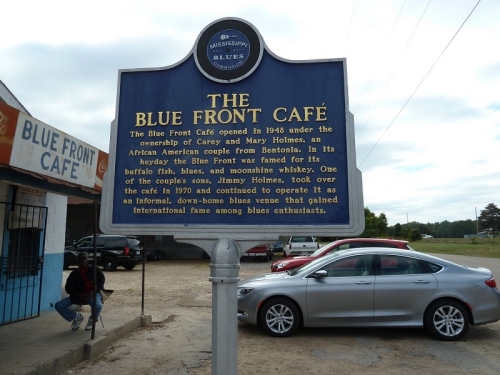 In its hey day, the Blue Front Café was a local gathering spot for workers from the Yazoo County cotton fields. 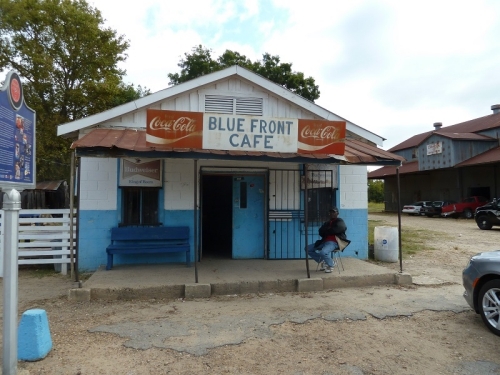 These days the cafe is popular with tourists from all over the world in search of a rustic and genuine blues setting. Unfortunately, not many people are familiar with the distinctive style of music that Bentonia produced. 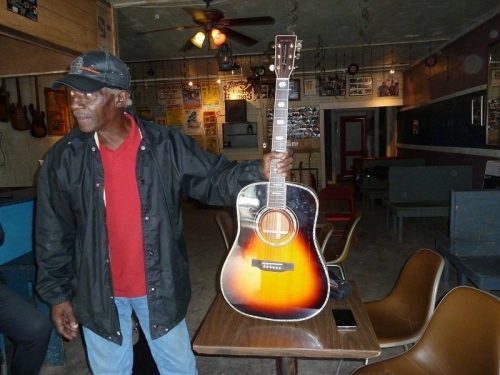 Experts describe the Bentonia sound as “a minor-tuned, haunting acoustic country blues sung in a near falsetto.” Holmes learned the style as a student of Owens, and is apparently the last person alive to carry on the tradition. If you want to step back in time, make sure you got a quarter for the jukebox, spin a few 45’s and serve up a discussion with Jimmy “Duck” Holmes. 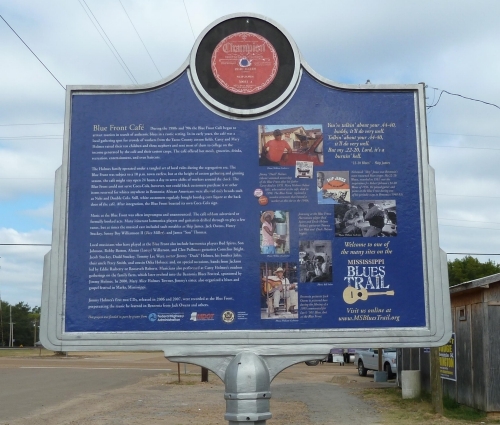 The whole visit really got my imagination working, and is a cool experience along the Mississippi Blues Trail…There are three blues markers in the Bentonia area. 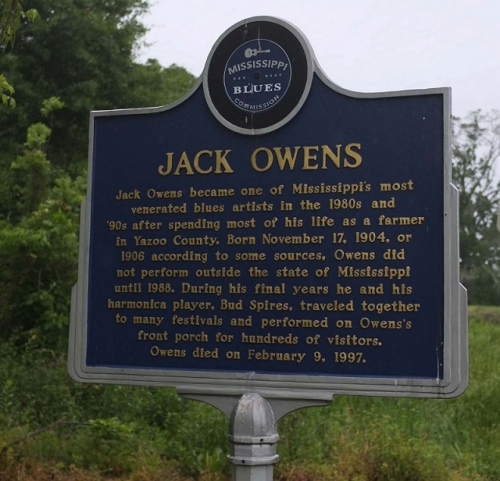 One located in front of the Blue Front Cafe, and one down the road of Jack Owens, and the third of Skip James at the corner of intersection of Highway 49 and Mississippi Highway 433 West. When I was at The B.B. King Museum and Delta Interpretive Center last April, we went through the facility rather fast. This time I was able to spend more time without being in such a rush. I also thought it was cool sharing the experience with my brother. I knew he would appreciate the exhibits and history of the Delta as depicted through the eyes of the great B.B. King. The exhibits include stories of cotton plantations, race relations, sharecropping, music, art, literature, and folklore. You’ll see how life progressed throughout the Delta, and how the blues spread across the nation and inspired the birth of rock n roll and the course of music history. When coming to the museum you should really set aside several hours to soak in the magnitude of the displays that are presented. The illustrative trip through time was very emotional for me and will probably strike a chord for most blues lovers. The museum is partly located in a historic brick cotton gin where B.B. King used to work, and is a MUST SEE whether you’re interested in music or Southern history. 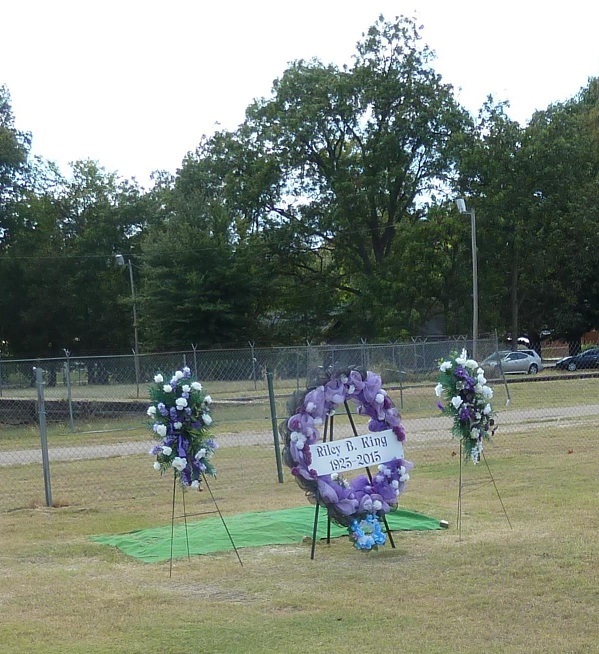 Make sure you stop by the front gate to the right of the building and pay your respects at B.B King’s resting spot. In my opinion, a trip to Indianola isn’t complete without a lunch at The Crown Restaurant. When I was last here last Spring I ordered the Chicken Allison – A wonderful meal with a delectable crunch of roasted onion and garlic! While it was outstanding, I really procrastinated at the time on whether I should order the Catfish Allison. This time around there was no hesitation, and I wasn’t disappointed. It was amazing and was a rich soulful taste explosion. And the Bayou beer bread was just as good as I remembered. Don’t forget about the dessert table with several different choices like Peach Pavlova, Southern Praline Pie, English Sherry Trifle and Chocolate Fudge Pie, just to name a few. The nice thing here is you can try a small slice of everything for only two dollars extra. A must for the dessert lover! I can’t say enough good things about The Crown Restaurant. It’s down to earth, very relaxing and the staff is attentive and friendly. They even remembered me from my last visit! There is also a wonderful shop with charming gifts, and of course mixes for a lot of their food. For more information about this amazing establishment, you can click on the links above. We checked into our hotel at The Greenville Inn and Suites. While the hotel was older, the rooms were comfortable and extremely quiet, considering we were on the main level. We only stayed in the room long enough to get changed, and then we headed out to Warfield Point Park and caught some of the opening night events at the Bridging the Blues sponsored Mighty Mississippi Music Festival. We were going back the following Sunday to catch some of the acts scheduled on the Highway 61 Blues Stage, but we wanted to get a preview of the festival and observe the vibe… The drive was only ten minutes from our hotel and easily accessible, well organized with straightforward parking. Festival volunteers pulled up with their golf carts and escorted you to the Stage. 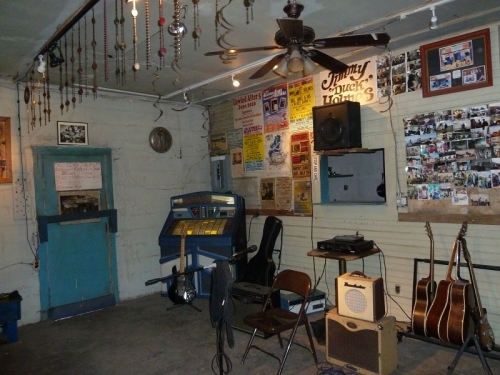 The festival location is characteristic to the Delta, and pays tribute to the area and its music. The weekend’s festivities were officially underway which saw acts like Cedric Burnside, GoofyBoots, Chris Stapleton, Old Crow Medicine Show, Ron Etheridge & The Damn Shame, Super Chikan, the Band of Heathens and numerous other local favorites. The stage was perfectly placed with the spectacular Mighty Mississippi as the backdrop. The sunset along the vast river was spectacular! The music wailed, and the grounds lit up with friendly faces and vendors ranging from Memphis BBQ, creole fish & Cajun shrimp baskets, crab cakes, tamales, turkey legs, BBQ pulled pork plates, and the local sensation Lost Pizza; just to name a few. The unusual cool breeze blowing off the Mississippi River didn’t effect people’s enjoyment of the event. The VIP tents, stage grounds and campsites were full of upbeat friendly people all having a great time despite the weather. Sure there were more down jackets, boots and blankets than you might expect, but that didn’t stop everyone from eating, dancing and having a terrific time. I was really looking forward to my return Sunday to catch some of the blues acts on the Highway 61 blues stage. There was one more stop I wanted to check out before retiring for the evening. 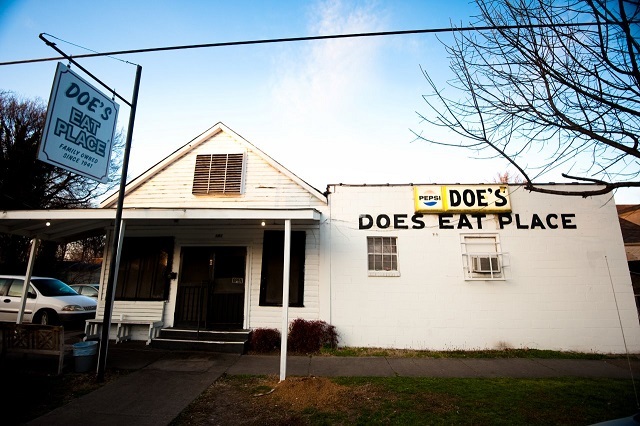 I had one last opportunity to visit Doe’s Eat Place – a classic dining spot in Greenville. After our brief visit on opening night of The Mighty Mississippi Music Festival, we arrived shortly before closing. Established in 1941, I heard so much about Doe’s Eat Place that I didn’t want to miss out. Normally I don’t feel comfortable being one of the last people seated for the night, but the place was still packed and the orders were flying out of the kitchen. Speaking of the kitchen, this is the first thing you see as you enter the restaurant. Huge cast iron skillets were filled with frying potatoes and bowls of salad were still being mixed. We also witnessed those incredibly delicious looking steaks being cooked to perfection. We were greeted with a warm friendly hello from everyone in the kitchen, and we were seated right away in the next room. The food, service and atmosphere was a real treat for the senses. The pictures and awards on the wall mixed with the clientele (many of which brought their own wine) make Doe’s Eat Place a real Southern treat. Please don’t be taken back by the very rustic looking exterior. It just adds to the timeless authenticity of dining at an old family restaurant. By the way, the steak was one of the best I ever had. The fries and salad were tasty as well. Make sure you go there with a big appetite, because you’re about to experience the biggest plate of food you’ve ever had placed in front of you. Unfortunately, I was too full to try their hot tamales, but they looked amazing. I didn’t see one dissatisfied person anywhere. Doe’s Eat Place have several franchises throughout Arkansas, Louisiana, Paducah, KY and Tulsa, Oklahoma. But if you’re in the Greenville area make sure you stop by the family owned original location, you won’t be disappointed. It was another long, but eventful day. We went back to our hotel and called it a night. Tomorrow my brother and I had another full day planned… So make sure you return because our next stop will be Cleveland for a sneak peek at the Grammy Museum, making its grand opening March 5th, 2016. Afterwards we go to Clarksdale, and visit the Crossroads, Ground Zero, Cat Head, Reds Juke Joint, Yazoo Pass, Abe’s BBQ, Rust Restaurant and The Shack Up Inn. Have you been to any of the establishments listed in this article? 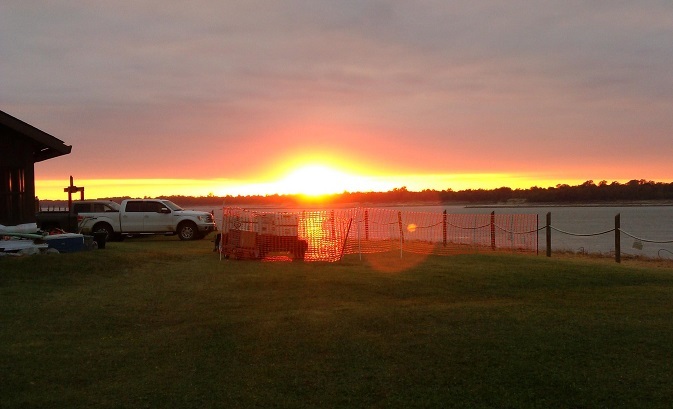 Were you at The Mighty Mississippi Music Festival this year to catch the fun? Please leave your comments in the area below. It would be great to hear from you.